What happens when the campaign is over? Back to work! I've been busy over the past couple of months, rebuilding my income stream with my business. Then yesterday, at a meeting with one of my professional connections, we were discussing all the lessons we have to share with the women we know who are just getting started in their businesses. (There are many). We talked a lot about bullies and boundaries (you can read more about that conversation here). Last night I was super-excited to see all the fabulous women of the Regent Park Catering Collective, selling their delicious food. (Of course, not having to cook after a long day was a bonus). It's been quite a week, with a conference, a strategy facilitation, Social Development Planning, chairing our monthly Community Meeting of the Regent Park Neighbourhood Association, and more. So I hope you'll forgive me that the schedule for this blog got blown a little off course. I do have time, and make time, to get together and make connections. so please do keep in touch. Even if the blog schedule suffers now and then, you can always find me on my personal and business Twitter, LinkedIn, or my work newsletter for businesses and entrepreneurs, with tips, ideas, and offers, and more. Here we are in January – and all around us, there’s talk of being better, improving, giving up bad habits, or taking up new ones. Some people avoid goal-setting, because they’re afraid of failure. They haven’t learned yet that failing to reach a goal is just an opportunity to find the lesson in it all. That’s the best part of stretching ourselves to accomplish something new! In 2018 I set a goal to win an election. I didn’t make it. What I did make were new friends, new ideas, a deeper connection to my community, and a host of resources and sources of help that I didn’t have before. I didn’t win the election, but I know I’m far more successful than I was before, because I tried. S - Be Specific. Decide exactly what you want to accomplish. Whether you use a mood board, an Excel spreadsheet, a journal, or some other tool, envision as specifically as you can, the outcome you want. M – Make sure it’s Measurable. How will you know if you get there? Even if you are enjoying the journey, it’s nice to have a way of being sure you’ve arrived at the destination you intended. A – Plan for Action. Besides having a measurable goal, think about some of the steps you will need to take to get there. R – Is it Realistic? Do you have the ability to do it? It really is too late for me to be an astronaut - but there are many goals I can set, that I at least have a chance to achieve, given time, effort, support, and resources. T – A goal that is Time-bound will help you push yourself to get it done. Don’t choose an impossible timeline, but do set a pace that will keep you from procrastinating, yet also avoids undue pressure that makes you give up hope. And on that note, what’s my goal for this year? To find a paying project that takes at least 180 hours (over the whole year, or in a shorter, concentrated burst) that incorporates the work that made me set last year’s goal – to contribute to eliminating hunger, homelessness, or illiteracy. That’s specific, time-bound, realistic and measurable – and I’m taking action by putting it here. If you or someone you know has a project that needs a "do-er", I’m ready to listen. Let’s talk. Everyone deserves a clean, safe, affordable place to live. The issue we're facing in Toronto is that we're missing homes at many levels. Studying the picture above from CMHC, you can see the continuum of housing; here in our city, the pace of construction of housing at all levels, with the exception of market home ownership, hasn't kept pace with the demand. It hasn't kept pace for decades. We really need to get creative in how we think about housing. Home ownership is an ideal for some, but in today's mobile, global society, it's impractical for some workers. Yet where can they rent? Imagine if the only place there is sufficient stock is the street ("homelessness") or very expensive homes where the individual or family need a huge down payment for even a small condo space ("market home ownership"). That just won't work. And right now, that's very close to where we stand here in Toronto. If you click on the image above, it will take you to the City's briefing notes for the incoming Council on affordable housing. Soon they're going to make decisions about Toronto's housing strategy for the next ​decade - from 2020 to 2030. That means that (a), we're currently working from a strategy that was written about a decade ago when things were very different, and (b), that we need to get it right, because we'll feel the impacts of their decisions for a very long time. So how can you, a member of the public, get involved? 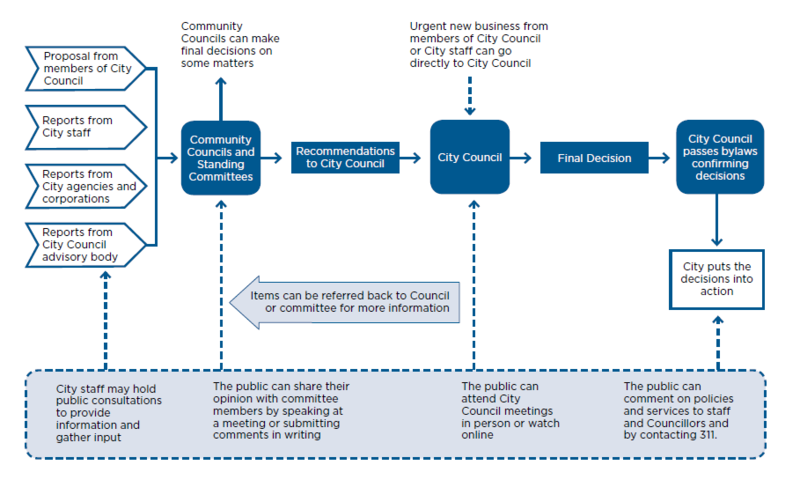 This chart shows the various places and ways the public can get informed, provide feedback and advice, and help. And here's where you can find out how and when to engage with initiatives, appointments, committees, or volunteer activities. Let's put our collective energies and ideas together, and make sure we create a City that has a home for everyone.